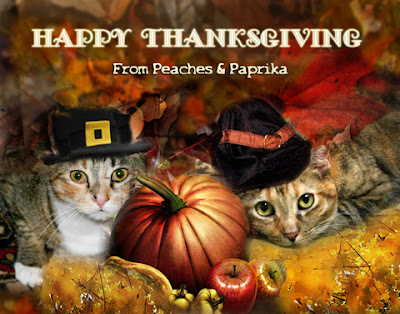 Peaches and Paprika: Happy Thanksgiving to all! Happy Thanksgiving to all our Blogger Friends! We count many blessings this year and you are among them!!! We are also thankful our human is generally nice to us because she puts "virtual" hats on us for holidays instead of making us wear real ones. You know? Speaking of days, have a wonderful one, whatever you do! We love those photos and Happy Thanksgiving from all of us! Thanks for joining the Thankful Thursday Blog Hop! Happy Thanksgiving to you and your human! Have a blessed Thanksgiving dear friends! Purrs from Deb and the Zee/Zoey gang. Gobble gobble hey! Wishing you all a very Happy and Safe Thanksgiving with all the trimmings! 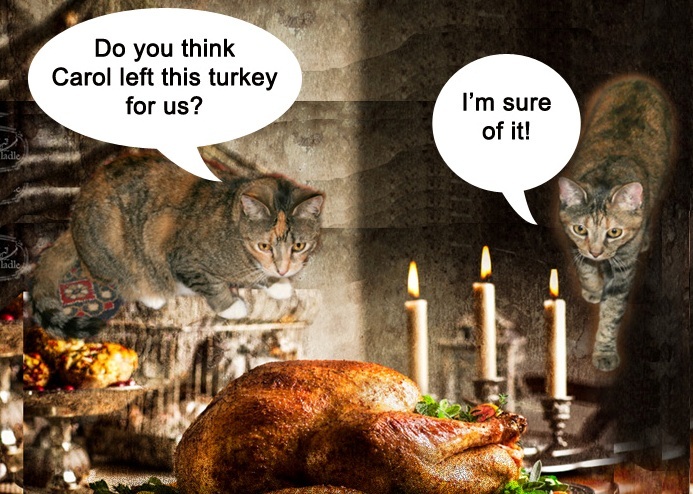 Wow, a whole turkey for you two cuties! Now that's something for which to be thankful. Happy Thanksgiving! Happy Thanksgiving to you and all my US friends. Happy Thanksgiving! We're so thankful for all of our wonderful blogging friends!! !